In Part 1 of our Understanding Direct Boxes series, we discussed the three primary functions that a direct box performs. Today, we will look at the two main types of direct boxes and how to use them. Selection of the appropriate DI for the job can make the difference between good results and great results. This choice offers the savvy engineer another tool to optimize the gain structure of their system. Running a passive single coil guitar? Grab an active DI. Slapping a modern bass with active pickups? Reach for the passive DI. Because the active direct box contains an amplifier the weaker signal inputs will be boosted before entering the stage snake. However, many designs like the Radial Engineering J48 Stereo can blur the lines between when to grab a passive or active DiI. Active DIs can be helpful for driving longer cable runs and they provide more headroom loud instruments. Making them a smart choice for keyboard instruments or track playback from a computer or smartphone. As you can see knowing the difference between active and passive direct boxes can help in optimizing the performance from your sound system. In addition to simply connecting an instrument they can play an important role in getting a clean signal through your sound system. Our recommendation is to invest in at least one of each and try them everywhere. There is no harm in trying them out. This will allow you to develop your own preferences about what to use with each instrument. The direct box converts a high impedance, unbalanced instrument level signal to low impedance, balanced mic level signal. One of the primary functions of the DI is to take the unbalanced signal from these sources and convert it to a balanced signal. This balanced signal can then be plugged into a standard microphone input on a stage snake or mixing consoles microphone preamplifier. Balanced signal connections offer greater rejection of noise that can be introduced to the system over lengthy cables runs such as common stage snakes. Electrical impedance is the resistance to the flow of electricity in a circuit. These unbalanced instrument sources are high impedance signals. High impedance signals tend to become dull, losing high frequency detail when traveling cable lengths over 15 - 20 feet. Using a short instrument cable to a DI can make an eye-opening difference to the tone of your instrument through a sound system! The final transformation that the direct box performs is level matching the signal to the microphone input of your mixer. Microphone signals are very low level signals, by contrast instrument level sources are higher in signal strength. A direct box allows you to plug in an instrument level signal into the microphone preamplifier of a mixing console. The direct box plays an important role in providing noise free, high quality audio from instrument level sources on stage to the console at mix position. With few exceptions, most DIs employ a transformer to accomplish their audio magic. The results are directly related to the quality of the transformer used. Well-constructed DIs can last several decades, so we suggest spending the money to get quality results for decades to come. If you would like to purchase some new direct boxes for your system give us a call. We would be delighted to to help find the right product for your needs. We regularly spend time to be aware of industry trends, allowing us to stay current on what is available for our customers. We are looking for disruptive products that offer previously unavailable features. Audio Everywhere is such a product! With Audio Everywhere you can utilize your new or existing WiFi network to distribute audio to a free smartphone app (Android and iOS). Systems start at only $800. Our new labor rate for onsite service and training will be $100 per hour. Blocks of time can be prepaid. 10 hours can be bought for $900 - a 10% discount. Charges for travel time and expenses are applied after the first hour of driving from our nearest office. Telephone technical support may also be charged at the hourly rate with discretion. Repair service rates at our service center in Indianapolis are $75 per hour. Intake, and possibly repairs, can also happen at our Fort Wayne office. Circle City Audio and Cincinatti Christian University are two organizations with similar initials, and similar goals, and we have developed a partnership over the past few years. From providing production for their annual worship conference to new lighting and projection systems in the university chapel, we have been working closely alongside CCU to provide excellent solutions for their technical needs. Recently we sent a crew to provide audio production for their outdoor 'Light the Hill' event, bringing all of the various gear needed to move a 7 piece band from the chapel stage, to the lawn of the 'quad'. The highlight of the night was the lighting of the flying lanterns that drifted majestically over the city, but underneath it all was a sound system that helped the team at CCU communicate with and inspire the students. We are glad to have been a part of another successful event, continuing the partnership between our organizations. The task was to overhaul the stage ceiling space (the church folks removed a false drywall ceiling to prepare the way) with a giant grid of box truss as well as 'finish' two home-grown truss spans over the congregation. We also added long truss runs down each side of the sanctuary for flexible lighting and camera locations. Additionally, the oddly shaped center screen that had been standing in the middle of the stage and shot with two projectors was replaced with a 16' wide HDTV format screen being illuminated by a fabulous Sony 6K laser projector yielding incredible brightness of the main/center screen even with full house and stage lighting. Now, all three projectors are running from the Blackmagic video system we installed last year instead of the center screen having to be separately fed due to the odd resolution so now the video presentation is much more seamless and any content can go to any screen. Lastly, we incorporated a bar system and fly points for a curtain system so the upstage side doors can be more elegantly used for stage access without people being seen coming on/off the stage. And when it is time for a baptism, the drape is simply drawn away from below the screen to reveal the sunken baptistery with easy viewing under the screen which bottoms at 7 feet high. Many thanks to Chris Curl and other folks from CCC who helped bring the project to completion by contributing many hours of 'sweat equity'! You've invited thousands of people from all over the country to join you at your bi-annual national conference, and you need the tools to inspire and engage them. You need to create a conference full of moments, moments that tell the story of your organization, moments that will stick in the mind of your participants. You do not want them to just hear about your organizations work, you want them to experience it in a personal and life changing way. You have an incredible opportunity to encourage your organization to grow, and you do not want to waste it. For us, it is not about the flashing lights and loud music, but rather, it is about using those tools to create an experience. 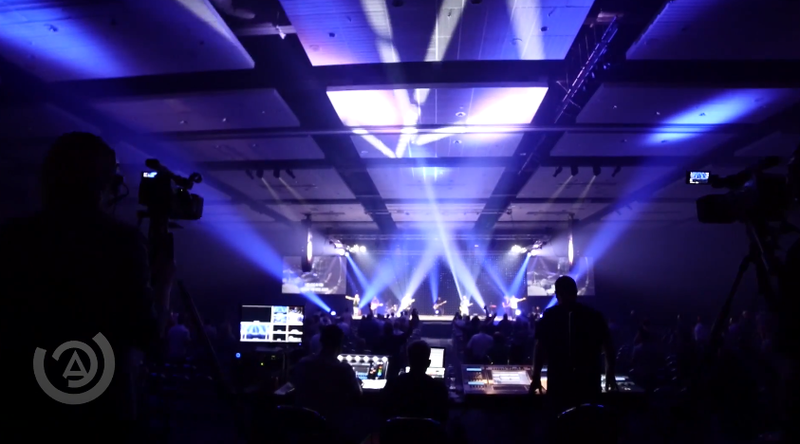 By putting together complex audio, video, and lighting systems, we gave our client the tools they needed to accomplish their conference's mission. Our experienced technicians were on hand to help as needed, and make sure the technology was never the focus, but instead remained invisible to conference participants. We have the tools you need to create something spectacular. This is all gear we own and is available for rental for your next event. Key Digital's Compass Control system allows us to provide our customers with a simple control system that utilizes any iOS device as the user interface.